ESXTOP is available in two ways. Either through the ESXi Shell or through the vSphere Management Assistant with the command RESXTOP. 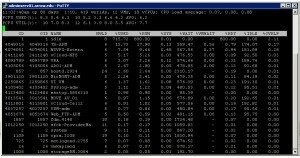 In this article I will focus on ESXTOP from the ESXi shell. It is very simple to get access to ESXTOP. Step 1: Get access to the ESXi Shell. This is done by opening your vSphere Client, go to host, configuration, security profile and start the ESXi Shell service on a specific ESXi host. Step 2: Download putty (or another SSH client) and create a SSH connection on port 22 to your ESXi host. Login with root and your password. 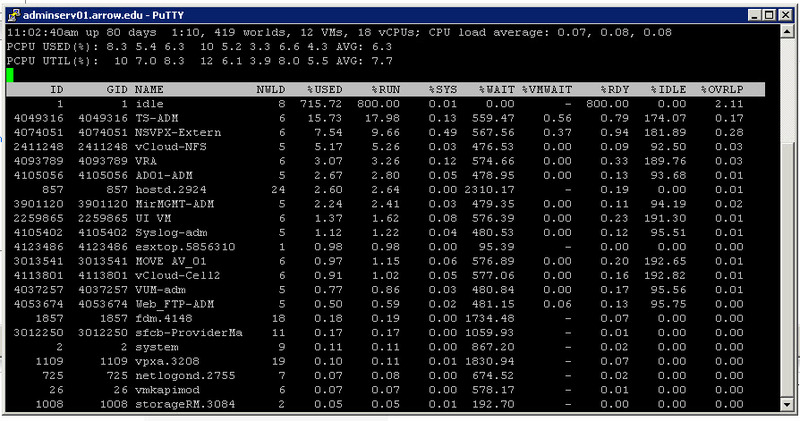 What you are looking at is the CPU screen in ESXTOP and you are now looking for CPU specific counters. You can browse around through different pages. If you type M you will see memory metrics. N for network etc. If you type H you will see all available commands. By default ESXTOP shows a lot of “worlds” a world is similar to a process in windows task manager. To sort it out and not show “vmkernel worlds” you type lower case v. By doing this you only see the virtual machines running on this specific ESXi host. Now you are inside ESXTOP so lets focus on some good counters to use for performance troubleshooting. When troubleshooting CPU performance for your virtual machines the following counters are the most important. %USED tells you how much time did the virtual machine spend executing CPU cycles on the physical CPU. %CSTP tells you how much time a virtual machine is waiting for a virtual machine with multiple vCPU to catch up. If this number is higher than 3% you should consider lowering the amount of vCPU in your virtual machine. When troubleshooting memory performance this is the counters you want to focus on from a virtual machine perspective. MCTL? This column is either YES or NO. If Yes it means that the balloon driver is installed. The Balloon driver is automatically installed with VMware tools and should be in every virtual machine. If it says No in this column then figure out why. SWR/s This value tells you the Read activity to your swap file. If you see a number here, then your virtual machine is suffering from hypervisor swapping. SWW/s This value tells you the Write activity to your swap file. You want to see the number 0 (zero) here. Every number above 0 is BAD.